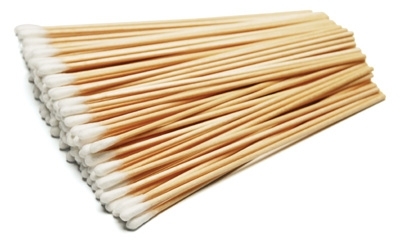 Our standard cotton tip swabs are rounded and are slightly less than 1/4" in diameter wound on a 6" wooden applicator. These swabs are ideal for cleaning with either water-based or solvent-based solutions and are excellent for the removal of varnishes and adhesives. Style #806 swabs are packaged in paper packets containing 100 swabs, a box contains 10 packets for a total of 1,000 swabs and a case contains 10 boxes for a total of 10,000 swabs. Please note that these swabs are non-sterile.